The modern lifestyle is a busy one: You're up early, there's never enough time. Fast food is not a pleasant option, but what choice do you have? The Back to Basics Toaster/Poacher serves up a hot meal in minutes in one appliance. No pans to face when you return home tonight, no choking fumes in a slow-moving drive thru, just a made to order breakfast enjoyed in your own kitchen. Because none of us want to balance our meal on our knees as we drive or to eat a greasy, cold sandwich by the time we can complete the drive to work. This ingenious device can, all at once, toast your bread/English muffin/croissant, warm a precooked meat item, and cook an egg. Whether you prefer a plated sit-down meal or more portable breakfast sandwich, it can be ready in the time it takes the coffee to brew. The appliance also boils up to four eggs. With a combination of these options, you could prepare a tasty brown bag lunch as well. Make quick treats for after school, a late night snack, or match up the ideal combination of carbs and protein for the post workout pick me up. Thanks to thoughtful design right down to the control pad, clean up is a wipe away. Individual functions have automatic shut-off features. 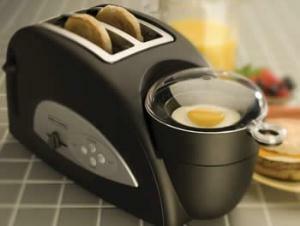 The toaster allows for light to dark adjustments and has a removable crumb tray. Essentially you're getting a bargain: three appliances in one device. Slightly larger than a typical toaster, but what you get for the added space makes it well worth a prominent spot on your counter--or bring it right to the kitchen table.